"It's been more than three years since one of the world's most innovative and successful circuses has unveiled a new show. Inside these tents, dozens of very nervous performers are preparing to challenge all that." 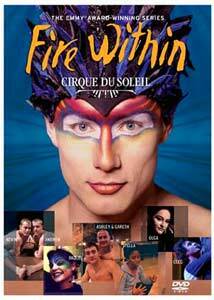 Fire Within, a fairly no-holds-barred, 13-episode look at the inner workings of a Cirque du Soleil show, was originally presented on the Bravo channel in 2003, and won the somewhat clunky-sounding Emmy for Outstanding Nonfiction Program (Alternative). The series focuses on the lives of eight different performers, following them from the initial auditions on through the assorted trials and tribulations of rehearsals, up to the unveiling of Cirque's elaborate Varekai tour. But this is no simple frothy puff piece on how great it is to be part of Cirque du Soleil, and it often makes the whole process look far more emotionally and physically challenging than the casual observer might realize. The thing about a Cirque live show is that the performers generally remain anonymous—there are no announcers spouting platitudes and introductions—and the overall artistic narrative flow of the performance is essentially more vital than that of the individual acts. A series like Fire Within breaks all that down and removes it, and we are given the opportunity to not learn the personal backstories of the potential performers, but director Lewis Cohen highlights the daily stress, pressures, contract issues and ego battles that seem to be a regular occurrence. This isn't a reality show per se, but there is plenty of real-life high drama to be found here as Cirque's Varekai show moves from infancy to adulthood. Whether it be the seemingly high maintenance African trapeze artist Stella Umeh, or longtime Cirque equilibrist Olga Pikhienko being given the chance for a key role, or gymnast Gareth Hopkins, whose personal tragedies provide the most emotional element in this series, it is the behind-the-greasepaint look that shows Cirque for the emotionally volatile process that it really is. The backstories are the key here, and by putting faces, names and personalities to the performers, all Lewis Cohen has to do is follow his subjects and let the dramatics play out. Each episode runs a brisk 23 minutes, and this is one of those series where it is very tempting to just watch one more ep, and before I knew it I had invested a couple of hours and was quickly immersed in the lives of the eight main subjects. As the series progressed from the early auditions, moving ever closer to opening night, the hard work and pressures build exponentially. Cohen, even working with the apparent all-access blessing of Cirque, does not candy coat the experience or the troupe, and as a result, Fire Within breathes with a refreshing dose of authentic realism, which only serves to make the dramatics and personalities that much more compelling to watch. Image Transfer Review: All 13 episodes are presented in 1.78:1 anamorphic widescreen, which was certainly a pleasant surprise, especially for a television documentary series, and on its own probably the most impressive element of the whole set. As with a lot of docs, image quality varies, dependent on where a given segment was shot. Minor grain issues are recurrent, but colors are largely reproduced well, though understandably not nearly as vivid as on a traditional Cirque performance DVD. Audio Transfer Review: Unlike most of the Cirque performance discs, where the Dolby Digital 5.1 tracks actually enhance the viewing experience, this documentary series doesn't benefit quite the same way. While audio is provided in both 5.1 and 2.0 stereo here, neither mix is particularly head and shoulders above the other, and considering a large portion of the material is backstage or rehearsal footage, the expansiveness of the 5.1 track, while a nice touch to be included, is actually minimal. Christopher Dyson's deep-voiced narration does sound a bit fuller, as do the opening credits, in 5.1, but I found no substantial difference between the two tracks during the majority of the content. Extras Review: Fire Within contains three discs, housed in thin-line NexPak cases, all stored in a cardboard slipcase. All of the extras are found on the third disc, and it is almost the equivalent of getting two additional episodes. The Reunion (22m:59s) gathers together all of the performers to sort of look back and chat about the whole experience, and while maybe not completely necessary, it does help finalize the series. Likewise with Q&A (24m:33s), in which performers Kevin, Andrew, Stella, Olga, Oleg, Raquel, Ricardo, Gareth, Ashley, Sarah, and series director Lewis Cohen individually respond to a handful of questions regarding the Cirque experience. There are also the usual Cirque DVD previews and trailers, including the mind-boggling Solstrom. Each individual episode is cut into five chapters, with optional subtitles in English, French, Spanish or Portuguese. Bravo's Emmy-winning Fire Within series gives a rare look at the turmoil, stress, and inner-workings of the Cirque du Soleil in 13 half-hour episodes. This is captivating stuff, and if you have ever seen a Cirque show or DVD (especially Varekai), this is well worth a look.